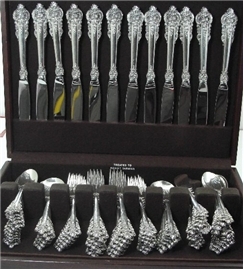 GRANDE BARRQUE BY WALLACE STERLING SILVER FLATWARE SET-NEW 8 KNIVES, 8 7/8" In original factory sealed wrapper. 8 FORKS, 7 1/2" In original factory sealed wrapper. 8 TEASPOONS, 6 1/4" 6 In original factory sealed wrapper, 2 open factory wrapper. 8 SALAD FORKS 6 1/2" In Original factory sealed wrapper. 8 OVAL SOUP SPOONS 6 7/8"in original factory sealed wrapper. PLUS THE FOLLOWING SERVING PIECES, all new with open factory wrappers GRAVY LADLE 6 1/2" 2 PIERCED SERVING SPOON 8 1/2" SERVING SPOON 8 3/4" COLD MEAT FORK 8" MASTER BUTTER HOLLOW HANDLE 6 5/8" TOMATO SERVER 8 1/8" PIE SERVER HOLLOW HANDLE 11 18" SUGAR SPOON 6 1/8" WILL BE SHIPPED IN BRAND NEW FLATWARE BOX. (SOLD) Offered is this beautiful sterling silver Place Size Service for 12 in the handsome Grande Baroque pattern by Wallace. The set consists of the following pieces: 12 8 7/8" Place Kvs. ; 12 7 3/8" Place Fks. ; 12 6 1/2" Salad Fks. ; 24 6 1/8" Tsps. ; 12 6 1/8" Cream Soup Sps. and 12 Flat-handled Spreaders; = a total of 84 pieces. The condition is wonderful. There has never been a monogram. Click more images for detail images.